Before this game (Golden State Warriors vs Portland Trail Blazers), I've only ever been to one other NBA basketball game. Even though Stephen Curry was still benched due to an injury, I still feel very fortunate to score a pair of tickets to the 2016 NBA Semifinals. As my brother said, it was a 'rare life experience'. 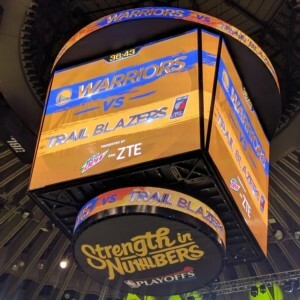 We arrived to Oracle Arena extra early, just to walk around, grab a bite (I think it was a $8 hotdog), and avoid some of the traffic. Upon entering, we got a yellow rally towel to take to the seat. On every chair in the stadium was large yellow T-shirt with the word "Strength in Numbers". As the stadium began to fill up, the big jumbotron began 'guilting' people not wearing their yellow shirt by putting them up until they put on their shirts. You could hear the stadium boo-ing them! The opener was amazing. Intense music, bold player introductions, pyrotechnics from the basketball hoop and jumbotron, dancing cheerleaders, and waving flags. This is not something I've experienced ever by simply watching the game on TV. The camera's are always focused solely on the players and even then, you don't feel the atmosphere of excitement because the TV somehow filters out all the noise of the music and cheering fans. The game started slow, but turned out to be amazing. None of the Warriors were able to hit their shots, especially their specialty 3-point shots, but they managed to keep the score close. It wasn't until 6 minutes left in the 4th quarter that the Warriors rallied to tie the game, and finally take the lead and win it! There was a lot of getting up on your feet and cheering when the Warriors were doing hitting all their shots. And because our seats were close to the court (maybe 3-4 rows back), a new experience was seeing player reactions whenever a penalty was called. Often times, the TV at the right angle to capture such emotions. The one upside to watching on TV is a much clearer viewing of the shot being taken. Almost 1/2 the time, I couldn't tell if the shot was a 2 or 3 pointer. As we headed out of Oracle Arena, fireworks were shooting over the stadium. I wonder if they have fireworks after every game, or only after playoff game wins. But it was a nice touch. The mess of people waiting at the valet line wasn't very efficient and it probably would have been faster for people to walk to their cars, but after I saw the mess of cars just trying to exit the parking lot, I'm feeling like the valet service paid off. All in all, I would definitely want to attend more basketball games. I'm well aware the tickets weren't cheap and this probably isn't going to be a very often occurrence. That being said, I don't know if I could justify ever paying for such expensive tickets. I'm more likely to go to regular season games, which are probably more affordable.